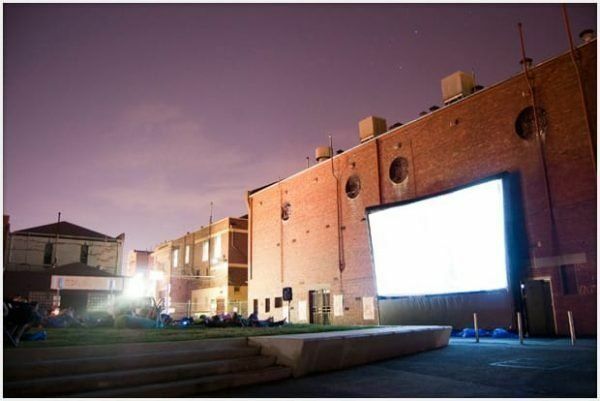 Are you looking to organise outdoor movies in Melbourne, Sydney, Brisbane, Perth, or Hobart? 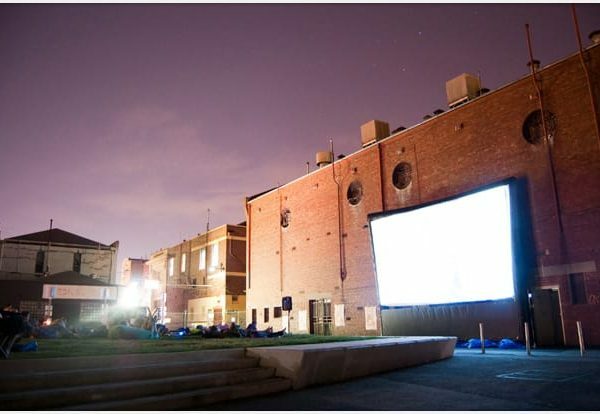 Are you planning a big open-air cinema event in your town or a drive-in at your local council? All you need for your special event is a big inflatable screen with all the audio and video equipment. This package is for you if you are ready to entertain a big audience! Do you want the most affordable system in our commercial range, and also the easiest to set up and operate? Then look no further! 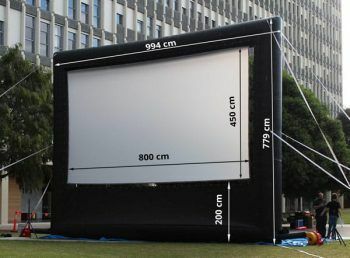 The 8m Touring® system is great for up to 1500 viewers. It comes complete with a mighty 8 metre screen, multimedia control SmartBox® Platinum, super bright projector, and 18″ active PA system. This professional cinema package will help you bring the magic of the movies to the communities all over Australia. Check our video to find out how to inflate a big inflatable screen of the Touring® series. 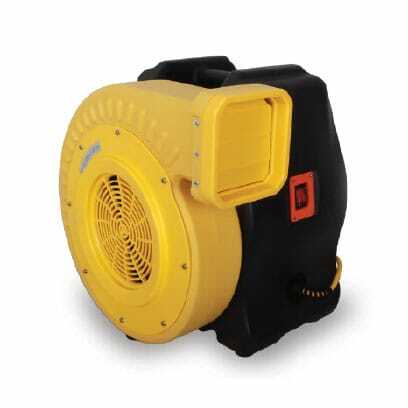 We supply 5000 Lumen bright projector as a part of the standard package. However, we are happy to offer you such options as a short throw lens, or a brighter projector. 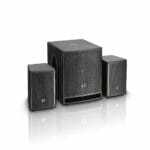 We offer the latest generation compact active PA System for clean and powerful sound. 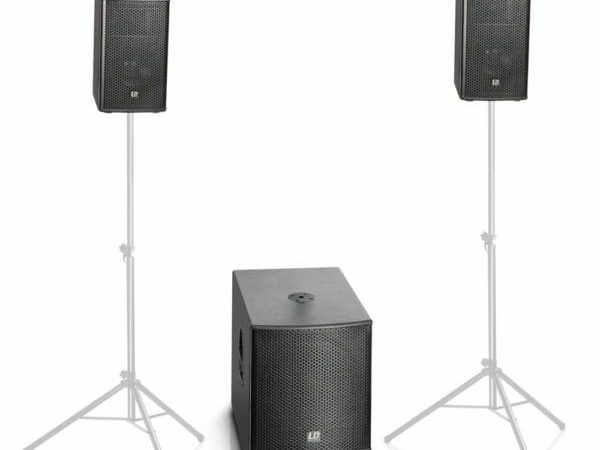 It comes complete with an 18″ subwoofer and a pair of passive satellites, and will give you 1200 Watt RMS. 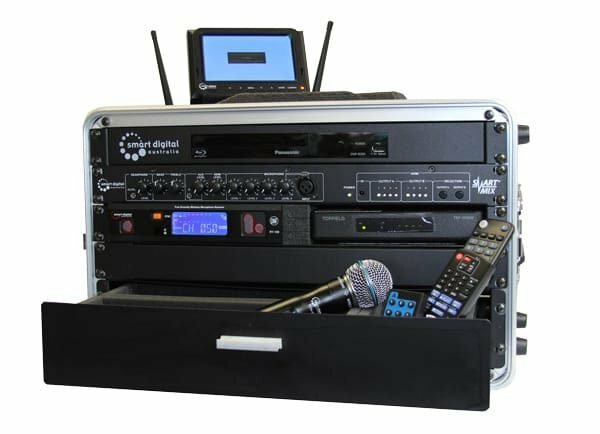 The SmartBox® Platinum is the ultimate convenient and portable multimedia control system. Thanks to the unique design, it allows for plug and play connectivity and minimizes setup time; moreover, it reduces the need for on-the-show fault finding. Five-inch preview monitor enables the operator to take full control of the image shown on the big screen. In addition, with attachable front and back casings, SmartBox® Platinum is fully enclosed for easy transport, storage, and easy set up for operation. We’ve been supplying outdoor movie systems since 2006, and therefore have enough experience to help you choose the best equipment for your event. Contact us to discuss your requirements or request training. We strongly recommend you to get a four-hour training session – setting up an 8 m screen is easy only if you know how to do it!